What is a CSF Chapter? 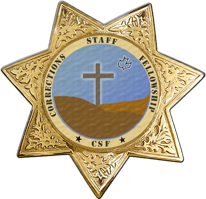 CSF Chapters are at the heart of Corrections Staff Fellowship. Chapters consist of informal groups of staff meeting at or near a custody, probation, or parole facility. Staff encourage each other to effectively incorporate their faith in all areas of their lives, families and profession, and learn how to make a difference in the Corrections workplace. Pray for the Lord’s guidance and direction. “Unless the Lord builds the house, it’s builders labor in vain.” (Psalm 127). Select a leader, meeting place, and regular day and time to meet. (available here), and agree to conduct Chapter activities in accordance with the CSF Statement of Mission and Faith.